Creating a new way to collect and dispense clean drinking water, the Skywell® atmospheric water generator has taken the familiar office water cooler and introduced a revolutionary technology that creates clean water from the air we breathe. All that’s needed to produce water from air is a Skywell and a standard electrical outlet. Just plug it in! The Skywell takes in ambient air and collects the moisture through condensation. Then it uses a six-stage water filtration system, ultraviolet purification and ozone treatment to remove contaminants in order to create clean drinking water. Before serving, the water dispenser’s built-in monitoring systems continuously inspect every drop to ensure that the water produced is of exacting quality and clarity every time. Ambient air is drawn into the unit as the proprietary filter removes dust, airborne particles and bacteria. The air is then condensed, collected and filtered using a proprietary purification process that meticulously removes contaminants. The result is fresh hot or cold drinking water. The convenience of the Skywell® atmospheric water generator makes users appreciate water in ways they haven’t before. No longer do co-workers lift heavy bottles when the water cooler runs dry or carry individual bottles to the office every day. From a placement perspective, since water pipes aren’t required, installing a Skywell in conference rooms, busy hallways or any location that needs water is as simple as rolling in a Skywell and plugging it into an outlet. The Skywell maintains the purity of every drop of water produced using advanced monitoring technology in combination with six water filters, two ultraviolet lights and ozone treatment. This unique system, which meets NSF (National Sanitation Foundation) standards, ensures every glass of water produced meets standards. Additionally, the Skywell’s built-in monitoring system continuously monitors the water quality to ensure that the water produced is of thoroughly tested quality, clarity and flavor every time. The flexibility to adjust water temperature easily allows users to customize temperature output to the specific needs of any office. The hot water temperature can be set up to as high as 200°F allowing for the instant making of the perfect cup of coffee, tea, oatmeal or noodles. If users need a cool glass of water, Skywell can provide it at 37 degrees, with no need for ice! The Skywell® atmospheric water generator comes equipped with an interactive touchscreen and dashboard, which run the Skywell app.  This app displays available water temperatures, the current water tank level, and water production. Using the app, users can quickly make adjustments to the Skywell including water temperatures, production hours and energy consumption. The Skywell offers you the unique ability to create a hydration profile so you can access personal water statistics such as the amount of water you have consumed to date and the positive environmental impact you’re having from using Skywell. Plus, you can set daily hydration goals and track your progress every day. You control your own water, eliminating your reliance on potentially contaminated municipal water and a decaying water delivery infrastructure. Perfect for offices, the Skywell® atmospheric water generator generates up to five gallons of clean drinking water per day, hot or cold. The Skywell app and its interactive touchscreen engages users and offers water consumption data and environmental facts. Environmentally and socially responsible. Skywell re-imagines the future of drinking water with a commitment to help reduce usage of plastic and its carbon footprint with no pumping, piping, shipping or delivery. Totally portable and convenient, it is not dependent on any outside water source. No trucks delivering big plastic bottles that require handling and storage, or single-use plastic bottles that pollute our oceans and clog our landfills. The Skywell app allows you to track your water consumption on a daily, weekly and monthly basis, as well as monitor the positive environmental impact that results from your reduced usage of plastic bottles. Plus, it offers you the opportunity to brand the Skywell with your company’s logo. Design and specifications subject to change without notice. Sharp and all related trademarks are trademarks or registered trademarks of Sharp Corporation and/or affiliated companies. Skywell and the Skywell Logo are trademarks or registered trademarks of Skywell, LCC in the U.S.A. and other countries. Find out how you can indulge your office with a glass of fresh water. See how Skywell® is changing the sustainability of our planet through atmospheric water generation. Find out why a Skywell® water dispenser is the better option for the office environment in this infographic.